But, on the negative side, it took several days of horrible air before the city enacted the free metro policy, and also the alternating odd/even license plate driving days for the city. So by the time we go into pollution-control mode, the out-of-control pollution is almost over. Last year's mid-March dismal air quality alerts were the first time we've experienced that level of pollution in Paris since we moved here almost four years ago now. This year may not be as bad, but it's definitely not our normal, lovely springtime in Paris. Well, the fact that I'm still wearing my heavy winter coat, because it's gotten cold again, doesn't help. And neither does global warming. "The high concentration of many fine particles, largely due to emissions from diesel engines and heating systems, knocks almost two years off the average life expectancy of residents of Bucharest, and six months off the life of Parisians." I'm assuming that's for a life-long Parisian, and so I hope that as a temporary ex-pat, my lungs will still make it to the ripe old age of 124 as planned, and not merely 123.5, which would be such a bummer. A Brousse (meaning, literally, "scrub" or "brush") is a lactoserum cheese; it's thickened that way, not with rennet or by pressure or by cooking. In this case, the Brousse is from raw sheeps' milk, made in the mountain/plateau town of Hures-la-Parade in the department of Lozère in the region of Languedoc-Roussillon, in southern France. It's a young cheese -- fresh and white, soft and with a texture somewhere between cream and mousse. I like the simplicity of the taste smeared on some bread with honey, or jam. It's lovely and light with a hint of gamy sheep flavor, and also a hint of floral citrus. What I really want it fresh air. But since that's out of my control, I'll settle for a nice fresh cheese like a Brousse de Brebis. 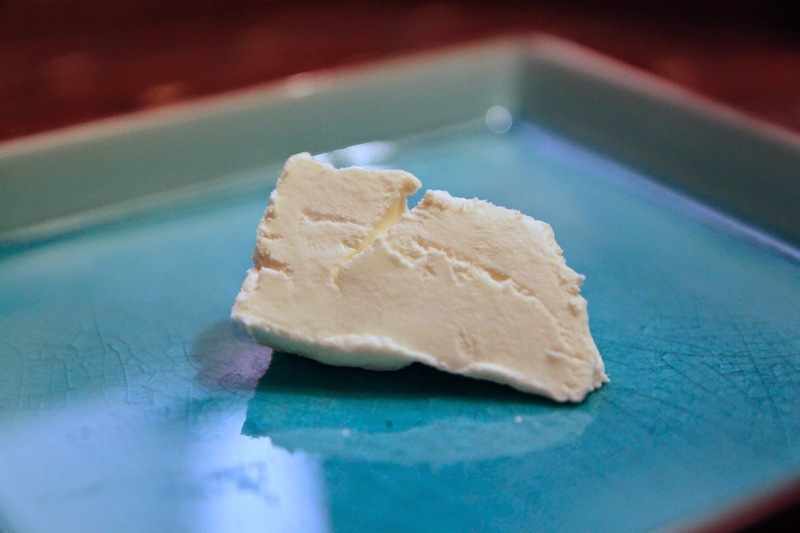 This light, airy, clean, white, delicious cheese is everything the air is not (that's right: so many pollution particles that the air in Paris is not even airy). "Brousse" means "scrub" or "brush" -- and I sure do wish I could scrub-brush Paris' air right now.